World's highest and fastest air-powered rocket! With five different power levels to choose from, you can launch Air Burst rockets to varying altitudes reaching up to 1,000 feet No flames, no fire, no batteries! The award winning Air Burst Rockets System incorporates an entirely new propulsion technology, utilizing air to create a shock wave and venturi effect that launches its rockets higher and faster than any non-combustion rockets on Earth! Through the bursting of membrane boosters within the launcher, Air Burst generates astounding power that sends its rockets to amazing heights. With a few s from a stand-up bicycle, its rockets can be easily and repeatedly launched. And the system is completely safe -- no combustible or expensive rocket engines used! With five different altitude levels to choose from, you can launch Air Burst rockets to varying heights reaching up to 1,000 feet and even beyond visual range. 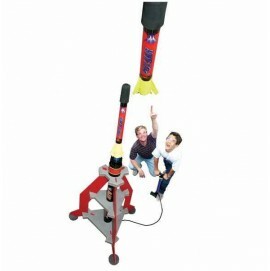 Be prepared for a truly amazing model rocketry experience! Outstanding power each set includes launcher, two different rockets with contrail streamers for enhanced visibility, and 60 membrane boosters. Bicycle sold separately below. (The system operates with any common stand-up bicycle) Also sold separately are additional rockets and booster membranes. Recommended ages 10 years to up. Adult supervision suggested. Each product the manufacturer produces is slated for extraordinary flight performance.